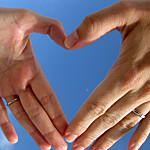 Hearts in Healthcare is an organization I follow that is a touchstone for the concept of bringing your heart to work. Here is their first video on the subject. Being emotionally available and caring deeply about your patients results in better care, better outcomes, more meaning for “the provider” and the patient. They call it bringing the heart back into healthcare. Being present is a proven burnout preventing component of Mindfulness. I am totally on board. This film is healthcare professionals and patients talking about what it feels like to bring your heart to work …. the difference it makes for you and your patients when you make the human connections that are possible when you bring your heart to healthcare.